Happy Halloween! For some this is a time to head to a fancy-dress party or send your little one’s trick or treating. To celebrate the scariest day of the year, we’re looking at the best Halloween campaigns we’ve seen spooking consumer this year. Jagermeister is focusing its advertising on Snapshat with an impressive $100,000 budget to reach out to Millennials. The Jägermeister’s AR campaign, called “Divine the Darke”, allows users to swipe up on Snapchat ads and trigger AR Snapchat lens featuring tarot cards meant to reveal users’ “cocktail fate.” Snapchat users can also access the experience through nine different Snapcodes found on Jägermeister products in bars and stores. The campaign already generated impressive results, including 32 million impressions, and 450,000 Snapchat users have swiped up into the lens experience. Not too bad for a campaign which only started on October 19. 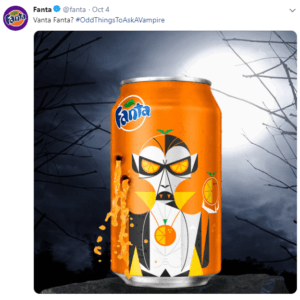 To celebrate Halloween, Fanta is throwing one of its biggest campaigns so far, including the launch of two new Halloween flavours, spooky limited-edition bottles and cans. The fizzy drinks brand is using Snapchat lenses and filters, and an experiential Halloween event called Twisted Carnival to promote the release. With a £3 million marketing budget for both outdoor and digital campaigns, it’s impossible not to have spotted the scary characters on the street of London. Fanta has also teamed up with Lad Bible and influencer Joe Tasker to bring the campaign to life with light-hearted content. The Coca-Cola- owned brand worked with Merlin Entertainments to throw the ultimate Halloween experience. The event takes fans on a freaky journey and promises to leave them equally thrilled and terrified in different parks including Thorpe Park, Westfield London and Birmingham Bullring. While M&M’s are a Halloween staple, it’s been 11 years since the brand released a new commercial marking the holiday. This year’s new commercial takes a humorous look at “surviving” the scariest night of the year as it suggests that Yellow may have died! The ad takes a Halloween-themed look at the brand’s longstanding irresistibility storyline to show what life (or death) is like when you’re a delicious piece of chocolate. With the famous two characters, Red and Yellow, M&Ms are always finding ways to bring some fun to any occasion. Along with the new commercial, the brand also created new Halloween-themed print ads, as well as some easy cooking videos on how to create Halloween treats using M&Ms. They are also promoting their usual Halloween flavours: Pumpkin Pie and Candy Corn and are using the season’s colour in all their social media posts to keep the theme alive. It’s not just F&B brands that are using Halloween to campaign their products. Dior Makeup got into the spooky vibe with an influencer campaign featuring Bella Hadid, where the supermodel demonstrated how to create makeup looks just for Halloween. The campaign in its second year has been a big success. Dior Makeup as part of the campaign created a landing page where shoppers can buy the full look, full of red and black products. Dior is mastering the use of influencers and understand that videos are key to attract their audience. Sometimes it’s the small details that matter the most. ASOS are always brilliant at changing icons on their website depending of the time of the year. Halloween is no different, when ASOS changed the profile logo to a little ghost. 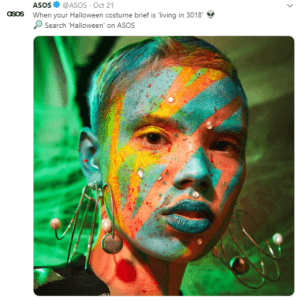 A funny touch that will remind people that Halloween is around the corner and that they can always use ASOS to find the perfect costume for this year’s Halloween party. ASOS are also producing inspirational content to show shoppers how to use their products including makeup and clothes. The online retailer is partnering with brands such as Gypsy Shrine to showcase dazzling face and body decorations. There is even a discount code just for today SCREAM15. 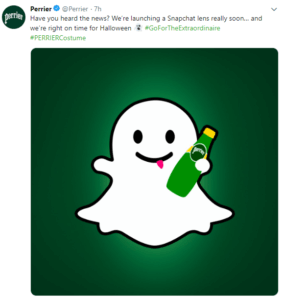 French water brand Perrier has paid homage to Kanye West dressing up as one its bottles by allowing Snapchat users to virtually do the same for Halloween. One month later, Perrier’s social team has consecrated the performance via the power of a Snapchat filters. Looking to capture the 18-24-year-old market, the brand has developed an AR lens that turns users into a green bottle, just like Ye. Snapchatters can then record a clip of themselves awkwardly bobbing and send to their friends. No need to buy a costume!